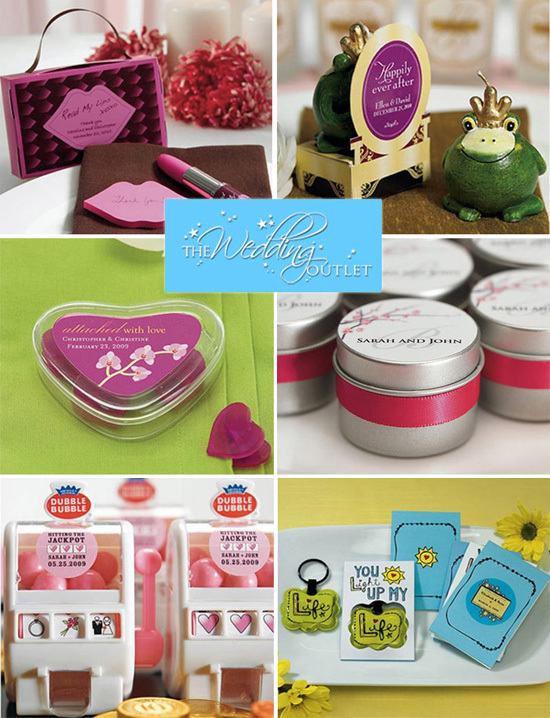 At The Wedding Outlet, you can inexpensively personalize your wedding with stickers and tags. 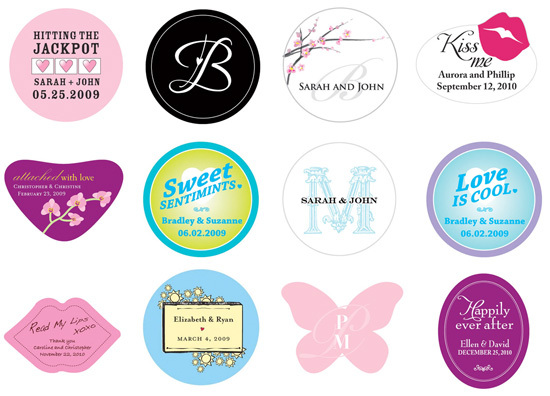 These adhesive stickers can be personalized with names, monogram, date and more. Stickers are great for any pre/post wedding event with many styles available to match your wedding theme. Check out these whimsical favors that work so well with the fun favor stickers available from The Wedding Outlet. And, even more ideas for using wedding stickers and tags follow . . . Include stickers in fun games. Give each guest a sticker when they arrive at the event. Pick a word that no one can say, like "wedding". If you say the word and someone call you out then they are able to steal your sticker. The person that collects the most stickers by the end of the event will not only be covered in stickers but will be the winner of a fantastic prize! Don't forget to seal your prizes with a sticker too! Use one of The Wedding Outlet's unique themed favors to give to guests and be sure to place a sticker on any favor for a personalized touch. Fill centerpiece vases with colored stones, fruits, or florals and apply a sticker to the outside of the vase to keep with your theme. Decorating a toiletry basket and display it in the reception's bathroom facilities. Have your servers wear in coordination with their name tag. Having a candy buffet? Attach to the candy bags. Many stickers are small enough to use as a seal for the invitation's envelope. Enclose a sticker (with covered backing) for guests to stick on calendar to mark the date. Having out of town guests? Consider a special basket or bag complete with goodies for guests to receive when they arrive at their hotel. Attach a sticker to complete the packaging.